Cakes with long names sound impressive, however bundt cakes remind me of school fetes and bake sales. There is something old-fashioned about them. To me, they say homemade cake. 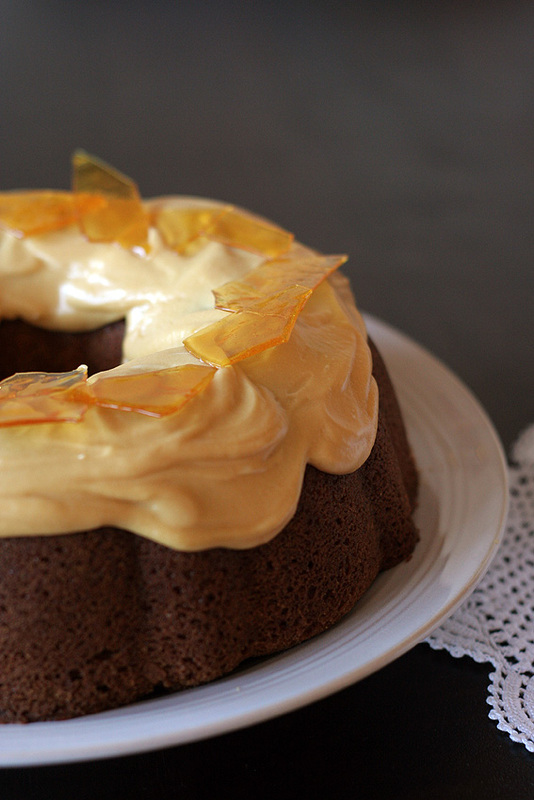 According to Wikipedia, bundt cakes took off in the ’60s. I bought a 24cm bundt pan to make this recipe – actually it’s a “fluted pan”since bundt appears to be a registered trademark. 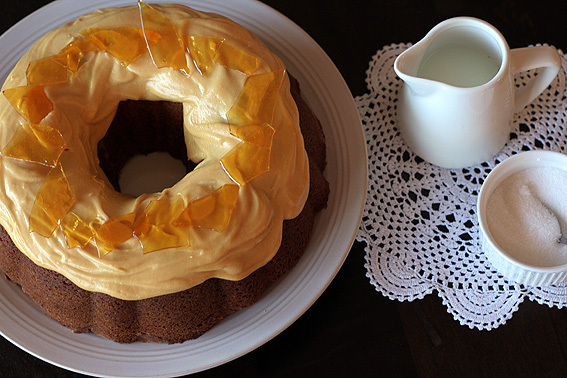 The burnt sugar bundt cake looks like a grown up, sophisticated version of what I usually expect bundt cakes to be. I attempted this cake twice today. The first time around, I didn’t burn my sugar for long enough. I can’t remember being disappointed I didn’t burn something before! The cake and the frosting both require a burnt sugar solution which is made of sugar, cream, coconut milk and lemon juice. Half of the mixture goes into the cake batter and half into the frosting. The first batch of burnt sugar I made was golden and brown, but for a dense-coloured and extra flavourful cake, the burnt sugar needs to be quite dark and rich in colour. Stir the sugar in a pan over medium heat until it’s the colour of molasses, and then keep stirring and heating it some more. Remove the saucepan from the heat and slowly add the cream while you keep stirring. Adding the cream too quickly will result in lumps of hard sugar. You can dissolve the lumps over heat on the stove but it seems best to avoid them if you can. Below are samples from the burnt sugar mixtures I made, the one on the right wasn’t heated long enough to make a dark-coloured cake. The frosting came together easily in my food processor. I added a little extra icing sugar to thicken it, and omitted 1 tablespoon of rum. 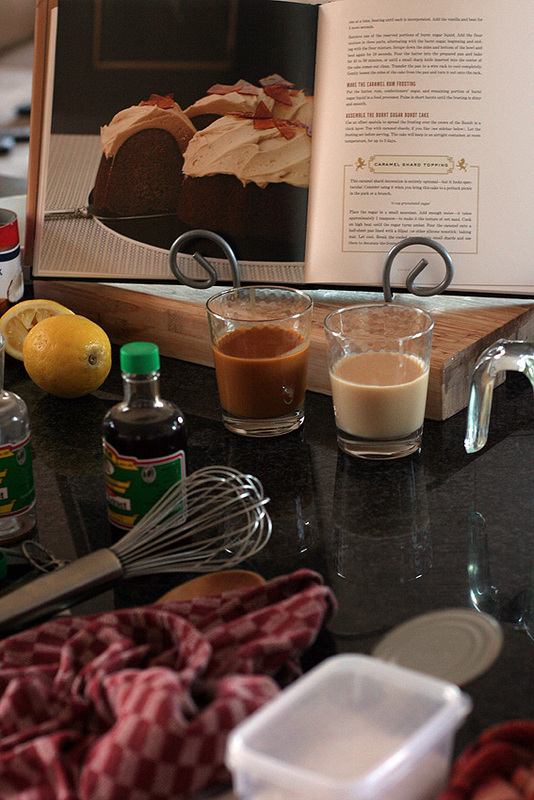 Next time I’ll use vanilla extract instead – I don’t care for the rum flavour. The sugar shards were easy to make with some melted sugar and water over high heat but mine were quite sticky to handle when arranging them on the cake. Official taste-tester hubby seemed pleasantly surprised by the caramel flavour of the cake, he remarked it wasn’t sickly sweet like some caramel-flavoured desserts. Find the recipe here on Amy Atlas’s blog. 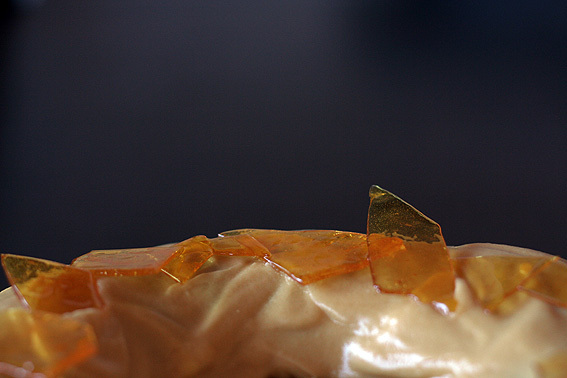 It comes from Baked Explorations: Classic American Desserts Reinvented. oh wow, that looks so good! I have to make a cake next weekend- maybe i’ll give this one a go- thanks! Thanks Jess, let me know if you need to borrow my shiny new bundt pan! Thanks Emma, hubby really loves this cake. I’m not sure I got the burnt sugar totally right, but the cake was yummy anyway. I’ll have to look for some more bundt cake recipes. I am so glad to see the art of homemade cakes surviving. I do not eat anything but homemade cakes; and I have lost a lot of weight because I get homemade from scratch cakes about once a year! Many people have gotten so use to the super moistness and fluffiness of partially hydrogenated shortening cakes (Crisco) that they have a hard time apprecitating the average homemake cake unless someone,for example Kaite knows the art, takes the time and patience, and has a recipe that is supermoist! I know they are moist by the art and ingredients desribed.